Governor Cuomo Deploys National Guard and State Police to the U.S. Virgin Islands After Touring Hurricane Irma Damage – The Caribbean American Chamber of Commerce and Industry, Inc. Governor Andrew M. Cuomo today announced the deployment of members of the New York National Guard and personnel from the New York State Police to the U.S. Virgin Islands after touring areas impacted by Hurricane Irma. One hundred members of the New York Army National Guard’s 105th Military Police Company, along with 30 members of the New York State Police, will deploy to the U.S. Virgin Islands this weekend to provide local authorities with security support on the island of St. Thomas. The team is being deployed at the request of Governor Kenneth E. Mapp, who also requested that Governor Cuomo travel to the region to survey the damage. 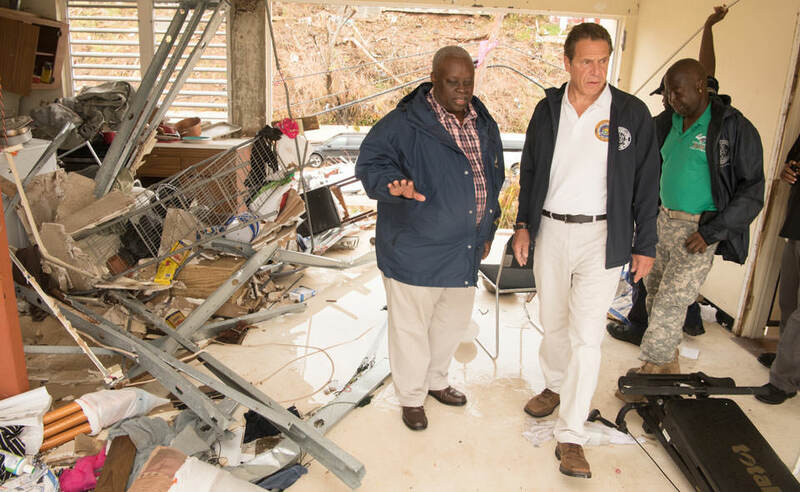 Governor Cuomo traveled to the region today, touring damage at the Estate Tutu Apartments on St. Thomas, visiting a supply distribution center and meeting with Governor Mapp and senior officials at the Government House. Hurricane Irma hit the U.S. Virgin Islands on September 6th, leaving St. Thomas and St. John heavily damaged after powerful winds at speeds greater than 150 miles per hour. Much of St. Thomas and St. John has been devastated and still remains without power as residents struggle to recover from the storm. The team will bring 12 Humvees and six all-terrain gator utility vehicles to augment security on the island. While deployed to St. Thomas, they will be housed on board the SS Wright, a federal Department of Transportation response vessel. New York and the U.S. Virgin Islands share a special connection. More U.S. Virgin Islands residents list their place of birth as New York than any other state in the nation. Governor Mapp was born in Brooklyn, New York, and attended both New York City Community College and the City University of New York. This deployment is not the first assistance offered by New York to the U.S. Virgin Islands in the wake of Hurricane Irma. Since Hurricanes Harvey and Irma hit Texas, Florida and the Caribbean, New York state has continued its support to areas impacted by these storms. More than 100 airmen as well as aircraft and vessels deployed following Governor Cuomo’s pledge of support to Texas and Louisiana. Personnel and aircraft deployed on August 26 included 104 Air Guard personnel, rescue teams, maintenance and support staff, three rescue helicopters, one rescue plane and several boats and watercraft. On August 29, Governor Cuomo announced the deployment of additional New York Air National Guard resources to assist in the Hurricane Harvey response in Texas, which included an HC-130 search and rescue aircraft carrying 15 more airmen from the 106th Rescue Wing. Additionally, a Regional Medical Plans Officer was deployed to assist with the evacuation and transportation of patients from area hospitals. A 30-member State Incident Management Team is supporting response and recovery efforts in Beaumont, TX, consisting of staff from the Division of Homeland Security and Emergency Services’ Office of Emergency Management, Fire Prevention and Control, and Interoperable Communications, State Police, Department of Transportation, Department of Environmental Conservation, Office of Parks Recreation and Preservation, Office of Information Technology Services, and Port Authority New York and New Jersey. Staff and inmates from the Department of Corrections and Community Supervision Food Production Center in Rome, New York sent approximately 40,000 meals to Texas to aid victims of Hurricane Harvey. Governor Cuomo deployed 130 Airmen from the New York Air National Guard’s 106th Rescue Wing, three HH-60 Pave Hawk rescue helicopters, and two HC-130 search and rescue aircraft and three Zodiac inflatable rescue boats to assist with initial search and rescue efforts in the U.S. Virgin Islands. This initial mission, which assisted in the evacuation of over 1,500 people, concluded earlier this week. Additionally, the Governor deployed Task Force 2 (NYTF -2), a specialized team of 35 first responders and equipment skilled in structural collapse rescue, excavation emergencies, technical rope rescues, confined space rescue, and other specialized rescues to Florida. NYTF-2 deployed with six boats for water rescue operations, two tractor trailers with equipment needed for urban search and rescue missions including structural collapse rescue operations, and two disaster search K-9 teams. On September 9, a C-130 cargo plane from the Scotia-based 109th Airlift Wing delivered medical supplies to St. Croix in the U.S. Virgin Islands. 10 UH-60 Blackhawk Helicopters and 55 soldiers from the New York Army National Guard’s 42nd Combat Aviation Brigade deployed to Florida on September 11 to assist in the response to Hurricane Irma. Additionally, airmen from the 105th Airlift Wing deployed a satellite communication team with seven personnel to Mississippi using a C-17 aircraft on Sunday, September 10 as part of the Hurricane Irma response and support for the Florida National Guard.